We’d love your help. Let us know what’s wrong with this preview of From a Low and Quiet Sea by Donal Ryan. The refugee. The dreamer. The penitent. From war-torn Syria to small-town Ireland, three men, scarred by all they have loved and lost, are searching for some version of home. Each is drawn towards a powerful reckoning, one that will bring them Farouk’s country has been torn apart by war. To ask other readers questions about From a Low and Quiet Sea, please sign up. In the last section of the book when Pop (Dixie Shanley) reacts to Florence's comment on the "welcome imperative" in Farouk's culture, Pop is predictively rude, but we know Pop is more open-minded and accepting that he lets on. Florence says, "she knew what he (Pop) really meant, what his fear really was, because she knew the truth of her father well, the warm and wounded heart of him." what is she referring to? I so want to write like Donal Ryan. When I read one of his books I'm just constantly in awe of his phrasing, his structure, and his grace. This was my second book by him, and confirmed that my love of his last book, All We Shall Know, was not a one off. I really liked the structure of this book - which I don't know if I would call a "novel", per se. Broken into 4 parts, we learn about three very different men, and then how they crash together. It's the type of structure that challenges me to ask I so want to write like Donal Ryan. When I read one of his books I'm just constantly in awe of his phrasing, his structure, and his grace. This was my second book by him, and confirmed that my love of his last book, All We Shall Know, was not a one off. I really liked the structure of this book - which I don't know if I would call a "novel", per se. Broken into 4 parts, we learn about three very different men, and then how they crash together. It's the type of structure that challenges me to ask "what can I do with structure?" More than anything, I loved the theme of empathy. I think that that is what this book is about. Really taking the time to look at people who aren't like you and seeing their worth and nuance. Though described as a novel, this felt like three separate stories of three different men, having only in common that each experiences loss and sadness. However, their lives touch in ways in the final part that I did not see coming. The first narrative is heartbreaking, painful , sad - no other way for me to describe it. It will give me pause every time I read about or see images of families escaping cruel treatment, injustices and regimes where they may be killed at any time. Farouk and his fam Though described as a novel, this felt like three separate stories of three different men, having only in common that each experiences loss and sadness. However, their lives touch in ways in the final part that I did not see coming. The first narrative is heartbreaking, painful , sad - no other way for me to describe it. It will give me pause every time I read about or see images of families escaping cruel treatment, injustices and regimes where they may be killed at any time. Farouk and his family are escaping Syria, hoping to find a place to seek asylum. This section was the most beautifully written and affecting of the three. Lampy is a young Irish man trying to get over the girl he loves who left him, trying to reconcile, trying to accept that he doesn’t know who his father is. John is seeking forgiveness for the awful things he’s done in his life, has always grieved the loss of a brother who he could never live up to. These stories in and of themselves contain a depth of their own, a sadness of their own, but it’s Farouk’s story that will stay with me. It is the last part that holds some beautiful moments that reflect, in spite of how hard life can be, there are times when love eases the load. The only other book by Ryan that I have read is The Thing About December, which is also beautifully written. Having read this latest, I’m sure I want to read his others. Do you know these books that make you fall in love with an author’s writing in a way that makes you want to read everything they have ever written? This was a book like that; it blew me away. I adore Donal Ryan’s way with words and the obvious care he takes to construct perfect sentences. This is more a collection of short stories but so much more than that in a way (and I say that as somebody who obviously loves short stories). Ryan tells the stories of three widely different men; the only thing Do you know these books that make you fall in love with an author’s writing in a way that makes you want to read everything they have ever written? This was a book like that; it blew me away. I adore Donal Ryan’s way with words and the obvious care he takes to construct perfect sentences. This is more a collection of short stories but so much more than that in a way (and I say that as somebody who obviously loves short stories). Ryan tells the stories of three widely different men; the only thing they have in common is a deep unhappiness with their lives. All three of them are fully fleshed-out, flawed characters that were a joy to spend time with. This is even more impressive when considering how few pages Ryan uses for his portraits. My favourite part of this book was the first: I adored everything about the way Ryan tells Farouk’s story. Here the language is the most whimsical and powerful, whereas later it becomes more understated (which works brilliantly as well, I might add, I just happened to adore beyond measure the beauty of the first part). Farouk is also the most sympathetic of the men and the one whose story seems most tragic. I do love how Ryan allows this story to be as tragic as it needs to while still offering glimpses of hope. Beyond being a perfect snapshot of these men’s lives, this is also an ode to storytelling in its different incarnations. Be it the fairy tales Farouk and his wife tell their daughter or the stories of pub life in a small town that connects Lampy and his granddad, Donal Ryan shows how stories are the glue that keep us together. Which I obviously love. I received an arc of this book courtesy of NetGalley and Transworld Publishing in exchange for an honest review. 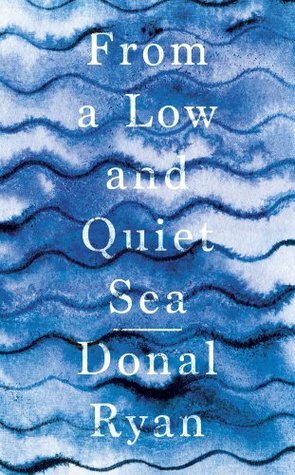 From a Low and Quiet Sea presents a wealth of personality facets that are wonderfully captured and animated in Donal Ryan’s writing style. It deserves to be applauded. The mixed emotions of empathy, distaste and concern for the different characters, gives you a full-on emotional experience. There are three very different characters, Farouk, Lampy and John, each tainted by life’s obstacles while they tried to live their hopes and dreams. Farouk, is a refugee fleeing with his family from Syria, Lampy, is a young man struggling to come to terms with his life's plans, and John, is a man that has stooped to horrible depths of immorality and wickedness, but finally hopes for redemption. Nothing is black and white, and the shades of grey illustrate the multiple layers of characterisation as we observe why each man has made decisions and struggled with what fate had in store for him. The rationale for the 3 storylines coming together at the end, is slightly tenuous, in terms of any plot or surprise event. It’s more to show the interaction between people, how close our lives can pass by others or connect causing an impact on the world around us, which is often a surprise and bewildering. As the book draws to a close it reminds the reader that the varying experiences of life and interactions are all part of living, regardless of our individual stories or status. My only criticism is that I found it difficult to follow the narrative at times, as there would be instant jumps in time either because of memories or switching to other periods to provide background. I had to re-read various sections several times, so you do need to pay attention and focus, which can interrupt the flow. So much more could be said here about each character as they are wonderfully portrayed, but I imagine and hope readers will take time to reflect on the characterisation and for reading clubs this will be a great book to discuss and dissect. Peter leslie hamod wrote: "Wonderful review Peter!🌹"
Peter JV ❄☃❄ wrote: "Grand review, Peter! 🥰"
Hi, JV, thanks a million, have a great weekend. :):) JV ❄️☃️❄️ wrote: "Grand review, Peter! 🥰"
Although a novel, it tells the story of three very different men who have all suffered losses. The first is Farouk and takes place in Syria, where the war has caused him to flee with his wife and child. Told in a compassionate tone, and heartbreaking to read, it is a story that has been told before. The last two take place in Ireland, Lampy, a young man brokenhearted, with a great deal of anger. He transports people from a care center who have appointments in different places. His grandfather is Although a novel, it tells the story of three very different men who have all suffered losses. The first is Farouk and takes place in Syria, where the war has caused him to flee with his wife and child. Told in a compassionate tone, and heartbreaking to read, it is a story that has been told before. The last two take place in Ireland, Lampy, a young man brokenhearted, with a great deal of anger. He transports people from a care center who have appointments in different places. His grandfather is rather amusing, his mother rather distant, and he hasn't a clue who or where his father is, having never met him. The third is John, who seems to be making his final confession, and he has much to confess. It is hard to imagine while reading these characters studies how they will all come together. Such talent though to write and form these three distinct characters, and make them seem so believable. It isn't until the final section when we see how these characters come together, and I was totally surprised, maybe shocked would be a better word, at the ending. There are many issues explored within, the inadequacy of the care system in Ireland, but it also holds true in my own country, the US. Also exemplifies the six degree of separation theory, and reminds us that it is important to acknowledge each person as an individual. To see how we are in many ways the same, suffer the same difficulties and heartbreaks in life, and the only hope for a better world is to show we care. That's what I got out of this anyway. From a Low and Quiet Sea is a short novel and actually reads more like a book of short stories as opposed to a novel but Ryan's prose and unique characters weave together beautifully to make this a fresh and moving read. The Book in broken up into 4 parts and in the first 3 parts we are introduced to three very different and colourful characters and in the last part of the book we lean how these characters tales are intertwined. Donal Ryan's prose and storytelling is flawless and I particulary enjoyed the story of Farouk a Syrian doctor who makes his home in Ireland and his Journey in life. While this is not an uplifting read by any means there is humor in this novel and I found myself smiling at a few passages in the book. While I enjoyed the other two character's stories I did find that the constant stream of counsciousness a little much and took away from the power of the stories for me. However this might be an element of the book that others may relate to better. I listened to this book on audio and what a terrific experience that was. One of the Narrators is Stephen Hogan who also narrated the audio on The Heart's Invisible Furies. My respect for Donal Ryan's writing grows with every book I read. This one is a masterly piece of storytelling, a short novel in four parts which appear to have little in common until the final part draws the strings together to deliver a devastating conclusion. The first part tells of Farouk, a Syrian doctor whose flight from his country with his wife and daughter is related brilliantly and humanely. For me this was everything that the much lauded Exit West was missing. The second part is the story of Lampy, a somewhat marginalised young dreamer who earns his living driving the residents of a care home around in a bus, obsessed with a former girlfriend and living with his single mother and grandfather. This section is full of comic detail but ultimately rather sad. Finally there is John, an old man expounding a grisly confession of a lifetime's misdeeds. This section is told in rather pompous quasi-Biblical language. The final short section really made the book coalesce in unexpected ways, and I won't spoil it for anyone who has yet to read it. There must be something in the water in Ireland: Last year, Sebastian Barry brought me to tears with Days Without End and Mike McCormick's Solar Bones left me in complete awe. On this year's Booker longlist and Costa shortlist, Donal Ryan is killing it, and once again, I am deeply impressed. For me, the strength of this book was not the story as a whole, and not even the individual narrative strands; rather, I was smitten with all those little vignettes, the pristine sentences and the way Ryan c There must be something in the water in Ireland: Last year, Sebastian Barry brought me to tears with Days Without End and Mike McCormick's Solar Bones left me in complete awe. On this year's Booker longlist and Costa shortlist, Donal Ryan is killing it, and once again, I am deeply impressed. For me, the strength of this book was not the story as a whole, and not even the individual narrative strands; rather, I was smitten with all those little vignettes, the pristine sentences and the way Ryan captures human nature by describing particular sentiments and inner movements - those perceptions make for vivid, complex characters, and I don't even need a big story when I can look inside the heads and hearts of such deeply humane protagonists. The book consists of four parts: The first one is about Farouk, a refugee; the second is about Lampy, a heartbroken college-dropout from a working class family who does not know what to do with his life; the third one is about John, an old man who looks back on his regrets. The last part brings all of these narrative threads together in the most unexpected ways. I don't even want to spoil any more of the content, let me just say that Ryan, not unlike his fellow Booker nominee Ondaatje, writes about the way the past influences our present, and how we deal with our regrets. While I was pretty underwhelmed by Warlight, I really enjoyed this book - Ryan's prose is less pompous and more urgent, IMHO. On top of that, Ryan manages to write a novel that points way beyond the actual events portrayed. Judith E Doesn’t look like I missed much passing this up! Paula Kalin Judith wrote: "Doesn’t look like I missed much passing this up!" No, Judith, unfortunately not. I was surprised I didn’t enjoy the book as much as I th Judith wrote: "Doesn’t look like I missed much passing this up!" Now longlisted for the 2018 Booker Prize. If a tree is starving, its neighbours will send it food. No one really knows how this can be, but it is. Nutrients will travel in the tunnel made of fungus from the roots of a healthy tree to its starving neighbour, even one of a different species. Trees live, like you and me, long lives, and they know things. They know the rule, the only one that’s real and must be kept …. Be Kind. Donal Ryan’s novel starts with a short meditation on trees, one that p Now longlisted for the 2018 Booker Prize. Donal Ryan’s novel starts with a short meditation on trees, one that perhaps might have been expected to have been taken from Richard Powers “The Overstory”, but one which sets out up front the underlying themes of this novel - empathy and kindness; as well as the key literary device employed - hidden connections. The majority of the book is taken up with three story stories - each a character study of a man (or boy) scarred by loss. First we read of Farouk, a Syrian doctor behind Islamic lines, torn between his medical and familial duties, he eventually uses his money and connection on an attempt to feel to the West, with his wife and young daughter, only to find that the trafficker he and others have paid is more of a trickster: the last part of the story is set as a refugee camp: Farouk’s refusing to accept the fate of his family and instead taking inner refuge in stories and urban myth. In many ways this section is simultaneously the most striking and topical (and I understand a departure from the Irish characters who have populated the author’s previous novels, as well as the rest of this book) and also the least authentic - although of course part of the author’s attempt to stress (see the final quote) the “oneness of all people”. Interestingly the author has previously written a radio drama “I Seek Refuge” about a Syrian girl crossing the Mediterranean and a short story “Long Puck” set around an IS inetrupltef game of hurling in Syria. Despite this he admits to being a “lazy researcher” and that Farouk’s story is lifted in detail from a news report with the character based on his own. Ryan has found that when he over-researches books he “tends to write non-fiction, to the plain to the reader what a thing is that they could easily know more about than me” and I find it fascinating that this is a common criticism of The Mars Room a book which was based on several year’s of immersive research by Rachel Kushner. The second story was my favourite - Lampy lives with his grandfather and mother and works as a mini-bus driver and assistant at a care home. Lampy’s sense of loss is both recent - his past girlfriend Chloe drifting apart from him as she went to University and he stayed in their home town - and life-long - Lampy knows nothing of his father who seems to have disappeared to England after his mother became pregnant. Lampy’s Grandfather is a foul mouthed but quick witted pub wag “When he was in form, he could slice the world in two” and he and the quick tempered Lampy cannot find an escape from their adopted personas and chosen fronts to allow them any way to express their love for each other to the perpetual hurt of Lampy’s mother ( “That small thing that could ease all of their minds he couldn’t do it. What was wrong with him” ). The third story is the most unusual - the detailed, end of life, confession (although to who - if anyone - is not clear at all until the next section) of John - a violent and unprincipled “lobbyist” (effectively a mover and fixer over local government contracts and planning permission) who builds up to a terrible confession via a difficult back story - a domineering father, a much admired Hurling-hero older brother who dies at the peak of his youth, a cruel older sister - and then via his own pathway into bullying and intimidation - starting at school where he punches a boy whose poem, about the English invasion gives this book its title. His loss and confession is centred around his only love - a younger barmaid and his own actions at the end of their relationship. As could have been expected from the opening passage - the final section, drawing on some minor characters including Lampy’s grandfather and a care home resident reveals how the roots of each characters story were, and continue to be, interwoven. Overall an enjoyable novel, admirably intentioned and from a clearly talented writer; but one which I felt lacked true depth and perhaps fell short of its potential. 3.5 stars. This book ! Oh, I really loved it. This is a reaction which I found surprising as I had expected to enjoy it in some kind of low and quiet way, appreciatively admiring. But that first story, knocked me for a six emotionally, it was in fifty pages everything I had wanted to get from last years Booker nominated Exit West. It totally made this book a worthy entrant on the 2018 Booker longlist in my opinion. However, that is only the first section of this novel. It would have been easy for Ryan to drop the ball at this point and while he does dramatically switch gears and moves back to a small town Irish setting, I was delighted to find I was just as engaged with the remaining two stories; that of the directionless adolescent - Lampy, and the elderly repentant, John. This is my first experience of Donal Ryan and I can say I think he is a master with characterisation. I really appreciate an author that so clearly puts you in the mind of a male protagonist and cultivates such empathy, especially when they are quite often behaving abominably. Its a great skill and one I liken in this case to Tim Winton's masterful The Shepherds Hut (which as an aside should have been on the longlist as well, but I digress). This book is probably going to suffer from the "is this really a novel" debate but I really couldn't be less interested in that question, as it worked for me as a piece of literature about loss, and regret and the suppression of emotional pain. All the stories are linked very subtly at first and then, a little unfortunately, quite obviously connected towards the end. Unusually, I would have preferred more ambiguity here. The last section seemed rushed, and like an editor asked the author to link three short stories so it could be considered a novel. Perhaps I would view this differently upon a reread, armed with the knowledge of how things will link. But generally the parts of this novel that really stood out, were the aspects that made each man unique, their individual defining moments of heartbreak. So cleverly, stealthily revealed, it's done so well you don't even realise the author has suddenly pierced your cold heart. The opening section of From a Low and Quiet Sea is quite a departure for Donal Ryan. Over the last few years he has earned a reputation as one the most eminent chroniclers of rural Ireland, yet this book begins in war-torn Syria. We are introduced to Farouk, a doctor, who fears for the safety of his wife and young daughter. He learns of a way to escape the country, which seems risky to him, but he eventually acknowledges that it's a better prospect than staying put. We follow the family's nervou The opening section of From a Low and Quiet Sea is quite a departure for Donal Ryan. Over the last few years he has earned a reputation as one the most eminent chroniclers of rural Ireland, yet this book begins in war-torn Syria. We are introduced to Farouk, a doctor, who fears for the safety of his wife and young daughter. He learns of a way to escape the country, which seems risky to him, but he eventually acknowledges that it's a better prospect than staying put. We follow the family's nervous journey to the boat that will take them away and hope that things will work out for them. The rest of the novel see Ryan return to more accustomed territory. The second part is narrated by Lampy, a teenager who lives at home with his mother and grandfather. Lampy has problems of his own - he never met his father, and matters of the heart have made him irritable, leading him to lash out at his family. In the third section we meet John, a conniving lobbyist who looks back on his life with much regret. Years ago he had an affair with a much younger woman, and he has been consumed by remorse since the relationship ended. Three short character studies connect to form From a Low and Quiet Sea, a restrained and impressive novel that seeks ‘the quality of light in another’s eyes’. What I most appreciated about From a Low and Quiet Sea was its economy. It’s a short book, less than 200 pages; each of the sections has only a brief time to make its mark, to capture that quality of light. It’s like one of those line drawings that manages to capture a person’s likeness in only a few pencil strokes. Donal Ryan trusts the reader to fill in the finer detail and so these characters – Farouk, Lampy and John – have as much depth and are as fully realised as if they’d each got an entire novel to inhabit. The fourth and final section is where the three stories collide. I don’t want to give too much away but it does tie things together. I have my own theory about the ending (which may or may not be what the author intended). I love Donal Ryan, and he continues to grow with each novel. I was struck in reading the section about the Syrian refugee doctor that opens the novel, that it reminded me of dystopian novels such as The Handmaid's Tale. Farouk, a doctor who lived a middle class life in Syria, escapes via a terrible boat journey, and ends up in a tent in a refugee camp. His current situation is nearly impossible for him to comprehend, and he recalls his life in Syria. While most dystopian fiction is set in the fu I love Donal Ryan, and he continues to grow with each novel. I was struck in reading the section about the Syrian refugee doctor that opens the novel, that it reminded me of dystopian novels such as The Handmaid's Tale. Farouk, a doctor who lived a middle class life in Syria, escapes via a terrible boat journey, and ends up in a tent in a refugee camp. His current situation is nearly impossible for him to comprehend, and he recalls his life in Syria. While most dystopian fiction is set in the future (sometimes near future), I was struck how much the deterioration of life in Syria fit the dystopian "mold". This may not be in any way a profound observation. Stories of war are the ultimate dystopian stories. I had the same experience with this book as with previous books by Ryan: absolutely loved the writing, the characters and their characterization. But I wasn't too crazy about the plot. Ryan is a fantastic storyteller but not a very good 'plotter' (if that makes sense to anybody else but me). The way the three stories came together felt too neat and rather forced, esp. John's role in it (the 'wheelchair'-scene was just too much). I also found the ending quite arbitrary, in the sense that the book I had the same experience with this book as with previous books by Ryan: absolutely loved the writing, the characters and their characterization. But I wasn't too crazy about the plot. Ryan is a fantastic storyteller but not a very good 'plotter' (if that makes sense to anybody else but me). The way the three stories came together felt too neat and rather forced, esp. John's role in it (the 'wheelchair'-scene was just too much). I also found the ending quite arbitrary, in the sense that the book might have ended at almost any point after the wheelchair-scene and it wouldnt have made a difference. And if there had been an additional chapter after the last one, I wouldnt have been surprised either. And finally, the overall message, hinted at in the intro that we are all connected, like the trees - or at least we should be - was a bit too sappy for my taste. This book of linked shortish stories has some very impressive writing with a very strong start in the fleeing of Farouk and family from their mother country, Syria I think, on a boat across to god know where. They are full of hope and feel lucky to be 'the ones that got away' that they could stay together and build a new life having just left everything they 'were' behind. From there, while the writing was quite brilliant, I wasn't so captivated by the stories of Lampy and John, but I did like t This book of linked shortish stories has some very impressive writing with a very strong start in the fleeing of Farouk and family from their mother country, Syria I think, on a boat across to god know where. They are full of hope and feel lucky to be 'the ones that got away' that they could stay together and build a new life having just left everything they 'were' behind. From there, while the writing was quite brilliant, I wasn't so captivated by the stories of Lampy and John, but I did like the ending chapter. I needed this closing sequence in fact because I am not a short story lover and this chapter, whilst it didn't work for some readers and was a bit in your face with the linkages, was necessary to me to feel that I had read an actual novel. This is probably my favorite of Donal Ryan's books that I've read. I think he does get better with each release. The ending was a bit lackluster but overall I enjoyed the storytelling most of his novels and the writing, as always, was beautiful. An enjoyable read of an author previously unfamiliar to me thought I found the structure of the book a strange one. The quality of prose, and in particular the Irish vernacular, and the streams of consciousness in both the "John" and "Lampy" sections, was spectacular. I can certainly understand why In a Low and Quiet Sea is Booker 2018 long listed. The opening story”Farouk” stands apart from a book about the Irish psyche, a book whose portrayal of the Irish is mostly uncomplimentary. Dixie (Pop) a An enjoyable read of an author previously unfamiliar to me thought I found the structure of the book a strange one. The opening story”Farouk” stands apart from a book about the Irish psyche, a book whose portrayal of the Irish is mostly uncomplimentary. Dixie (Pop) and John, in particular, are both verbally and physically crude. Why Farouk appears, I’m not sure; it’s gently written, its well written, it’s an all too familiar story of middle eastern migrant displacement. The Farouk section is only fifty pages in length and the book would not have been any less striking without it, I felt. Exit West while itself a concise book, still had enough content to allow this reader to feel a more immersive sense of personal loss and grief against the hideously inevitable and familiar background of civil war. The overriding philosophy of the Farouk section is unfortunately not heeded by our narrator. The two Irish stories are also largely stand-alones. Laurence Stanley (Lampy) is an unremarkable young man. His life is one of suppressed/ repressed sexual longing- women of all ages are sized up for their sexual allure. If you like literature to have a degree of ambiguity, the John section is the one that makes you think about the book after reading it, and it’s the section which makes this a dark, brooding, read at times. John is a man who bears “false witness” and who describes himself as a “lobbyist”. Both expressions are euphemisms for a man who manipulates and bullies his way in life. The supposition is that life in the shadow, forever, of a nicer, kinder, better, sibling, might result in a bitter, violent, person emerging. The John section throws up the majority of (unresolved) questions about this book. - Why is this the chosen book title? • John’s dream about a quayside, and a lost child (the second lost child in the book). What is the meaning? • An airplane journey hit by extreme turbulence, and a silent male, fellow passenger. How does this tie in? The title of the book, the child at the quayside, Lake Islands, Farouk’s tragedy- it would seem that water plays a big part here? So, I finish the book with a number of neat tie-ups in the final section, but I’m left with various unknowns. That seems to me to be an excellent return on a book that I would be very happy to see shortlisted on what promises to be a strong Booker year in 2018. Three separate (but ultimately linked) stories about three very different men in present day Ireland. I found the first story - Farouk's - the most moving and engaging, however the other two stories are memorable in their own ways. I also preferred the writing style in the first story, which was less stream of consciousness-y than the other two - which contained a lot of suuuuper long sentences, think like two or three sentences on an entire page. This style was more akin to the writing in All We Shall Know, so if you enjoyed that I think you'd enjoy this too. Another beautifully written and moving piece of work by the brilliant Donal Ryan. Having read Ryan's previous three offerings, I was wondering how he would move on from stories about rural Ireland's dispossessed. Authors write what they know, so moving on to new subjects and into new territory can sometimes mean a sacrifice of the richness of their work. This is certainly not the case here, however. When Ryan introduces the first protagonist of this new book, we know this is going to be a little different. Farouk is a Syrian refugee hoping to escape his homeland with his wife and daughter. The passages that describe Farouk's plight are absorbing and emotional, with a gentle pace and stunning prose. I found this to be the most moving section in the book. As the novel is divided into four relatively short sections, we are soon introduced to our second protagonist: Lampy is a carer, still living at home with his mother and grandfather. He is recovering from a broken heart and his experiences are both moving and honest, and often hilarious. Describing an Irish character who feels 'stuck' is familiar terrain for Ryan, and Lampy is recognisable and engaging as a result. Our third protagonist, John, is an accountant and lobbyist still obsessing over a failed love affair with a younger woman. He's a real money-man, and a dishonest schemer, but is vivid nonetheless. In fact, both Lampy and John are very well brought to life by Ryan, making them his most vivid characters to date. But it truly is Farouk who steals the show. He is the heart of this wonderful novel and when he exits after page 50, we miss him. Thankfully, the last section of the novel brings our plot into focus and we uncover the connections between our characters, reintroducing us to Farouk. What emerges is a heartbreaking tapestry of stories that carries some jaw-dropping revelations. I loved how this story came together and think the result only further cements Ryan's talent as one of Ireland's most impressive and prolific writers. No one I have read thus far is as skilled at capturing the minds of young men stuck in small towns in rural Ireland; men who are longing to escape their fates and achieve greater things, only to be pulled back in by the lures of home and family and responsibility. He is also remarkable in his ability to write characters who are living with regret; those who are reliving the mistakes in their lives every day. Yet, Ryan does it with compassion but without judgement or sentimentality. Ryan writes gorgeous, resonant prose full of lyrical cadences but somehow I can never quite love his books in the way I want to. Here he creates 3 mini character studies of men bowed beneath what life throws at them: one is maimed by the extraordinary losses of war and flight, the others by more mundane events, but all 3 are damaged in their different ways. The final section brings them all together in an unexpected way. This is a short book, under 200 pages, but the depth of emotion conjured bel Ryan writes gorgeous, resonant prose full of lyrical cadences but somehow I can never quite love his books in the way I want to. Here he creates 3 mini character studies of men bowed beneath what life throws at them: one is maimed by the extraordinary losses of war and flight, the others by more mundane events, but all 3 are damaged in their different ways. The final section brings them all together in an unexpected way. Convergence and interconnectedness seem to have been a theme of several books I’ve read recently. For example, Entanglement by Katy Mahood and Oliver Loving by Stefan Merrill Block. Of course, knowing that disparate storylines will converge at some point in a book can mean the reader spends the whole time anticipating that convergence or looking out for subtle clues as to how it will come about. Can I just say, don’t bother with this book, because the author achieves the bringing together of the Convergence and interconnectedness seem to have been a theme of several books I’ve read recently. For example, Entanglement by Katy Mahood and Oliver Loving by Stefan Merrill Block. Of course, knowing that disparate storylines will converge at some point in a book can mean the reader spends the whole time anticipating that convergence or looking out for subtle clues as to how it will come about. Can I just say, don’t bother with this book, because the author achieves the bringing together of the different strands in an unexpected and quite unsettling way. In addition, to think about it too much would, to my mind, mar the enjoyment of the journey and the wonderful writing. The prose with its long, flowing sentences gives the reader the sense they are inside the heads of the characters, experiencing their thought processes, impressions and feelings as they occur. The author creates some imaginative metaphors, often incorporating the sea, water or tidal forces. ‘He knew the rhythms of the house and the two people below him, the syncopated beats of them, the tides that flowed and ebbed with no regularity but with a strange and comforting predictability’. I also loved this description of how a rumour with no truth to it can spread if set in motion by skilled but unscrupulous hands. The sections told from the point of view of Lampy and John, with their use of vernacular and colloquialisms, perfectly capture the rhythm and lilt of an Irish accent. Can I mention at this point the wonderful character that is Lampy’s grandfather? His telling of tall stories and slightly embarrassing jokes (that are meant to seem spontaneous but have actually been well rehearsed), don’t help Lampy’s low self-esteem. However, they actually disguise his grandfather’s inability to express the affection he really feels for his grandson. Although their life paths initially appear to have no prospect of overlapping, each of the three men – Farouk, Lampy and John – share the experience of loss and betrayal. However, their psychological and emotional reactions to what they have experienced will be very different. In two, their response will probably earn the reader’s sympathy and understanding. In the third, the response may be, like my own, rather different. At the end of the book there is retribution but brought about unwittingly in a way that one suspects will cause further psychological scars. However, there is one small spark of hope for the future. I am so grateful to have been introduced to the assured, beautiful writing of Donal Ryan. From a low and quiet sea. They laughed, and slaughtered us. This is the beginning of a poem written in school by a very minor character in Donal Ryan's new novel. A schoolmate, the class bully, asks him who is the "we": the Irish resisting the Norsemen, the Anglo-Saxons invaded by Normans, or the victims of some other invasion? The moment somebody uses that plural pronoun, he lays himself open to challenge: by what right does he identify with that group? The questions of group identity, suspicion of those outside the group, and the search for connections that can bridge these differences run though Ryan's book in a subtle, understated way. But I am not even sure that this is his main theme. For instead of a normal novel, Ryan has given us a puzzle, in which the reader must do as much work as the writer. The first part consists of three long stories of about 50 pages each; the last 30 pages seek to link them together. But not in a neat signed, sealed, and delivered sort of way. Questions remain even after the cover has been closed. Be wary of prescription and proscription, of unyielding belief. All of it is dangerous; even something so lovely as this can turn to madness. And he talked on about the universe, and the oneness of all people and all things, how man was Nature's way of seeing itself, of feeling what it's like to be. And he said again to listen, to observe, to do your best to hear beyond the spoken, to see the quality of the light in another's eyes. He remembers a dream he's had. About standing on Thomond Bridge, watching the water flowing black and fast and high, up from the city towards Thomondgate, the wrong way. He was looking at it, marvelling at the speed of it, the height of it, touching the ramparts of the bridge almost, and he was telling someone whom he couldn't see that this was normal, that the river was tidal as far as Curragower, that it was just a fast tide coming in, not to worry, and the bridge groaned and shook and collapsed into the water and the water was warm around him, and it carried him upstream past King's Island and over the salmon weirs. and the river rushed inland against itself, away from the sea, and he was laughing when he woke, and as the dream faded he thought how easy it would be to let himself be carried to his end. To close his eyes and fall. Anyway, there was nothing, it seemed, that I couldn't get done. No plans I couldn't have brought to fruition, no White Papers I couldn't have transformed into law, no land I couldn't see bought or sold or parcelled or changed from green to red on council maps: whole towns rose up from the soil with the energy of my whispered words, my unbreakable promises, the grip of my enveloping hand. This was a new kind of a thing in people's minds, but discredited nearly before its birth, like the child of a prostitute. I was among the first, anyway, if not the first, to be given the title. I wasn't the first one, though. Wasn't Jesus Christ Himself petitioned as He starved and thirsted in the desert? The envelope He was offered contained the world. Lake Islands. Rather than the name of a person, the short final section is named for a piece of local geography. It is a good title, for it takes the three separate entities and, if not actually bridging them, at least places them side by side in the same body of water. I won't say how, but all three title characters are shown to be connected. But those factual connections are not the key that will lock this entire novel into a single matrix. That is still left to each reader to figure out. The connections that matter are not linear and causal, but poetic, a subtle rhyming of morality of theme. If such a loose association will not work for you, then the book will seem little more than three stories, and as those of Farouk and John at least are very good, that may be enough for four stars. But I go further, sensing the underlying wholeness, but also that it would be wrong to put it into words. It takes courage to write a novel with such risky faith in your readers, but Donal Ryan has never been one to choose the easy route. Hats off to him! From a Low and Quiet Sea is my second Donal Ryan novel after All We Shall Know, and so far he's two for two if we're grading for emotional devastation and positively stunning prose. Ryan's style is everything I love about contemporary Irish literature incarnate - the lyrical, almost breathless writing which deftly balances black humor with an aching sadness, the quiet introspection of his characters, the skillful exploration of pain and loss and grief and religion and loneliness. From a Low and Q From a Low and Quiet Sea is my second Donal Ryan novel after All We Shall Know, and so far he's two for two if we're grading for emotional devastation and positively stunning prose. Ryan's style is everything I love about contemporary Irish literature incarnate - the lyrical, almost breathless writing which deftly balances black humor with an aching sadness, the quiet introspection of his characters, the skillful exploration of pain and loss and grief and religion and loneliness. From a Low and Quiet Sea is essentially a series of three short stories - the first follows Farouk, a Syrian refugee who pays a man to help him escape his country with his wife and daughter; the second is about Lampy, an Irish teenager who lives with his mom and grandfather and who's still desperately in love with his ex-girlfriend; and the third follows John, an old man who grew up under the shadow of his brother's death. Their stories converge at the end rather unexpectedly, but in a way that I thought was rather brilliantly conceived. As with any novel that changes perspectives, it's inevitable that some will be stronger than others. The opening chapter - Farouk's - is far and away the most accomplished of the three. Ryan doesn't rest on the already tragic premise; he crafts a positively harrowing journey for this character, and as we wrap up his story and proceed into the second section, it's almost painful leaving him behind. John's chapter is stunning as well - it's the only one told in first-person, as his story takes the form of a confession - and of the three it's the most episodic, lending it a very readable quality while still getting to the heart of this troubled and compelling character. For me, Lampy's chapter was notably the weakest. Though there was some poignant commentary here about growing up fatherless, I felt that there wasn't enough of a story or a character arc to justify this section's length. This is one of those books that was stressing me out as I headed toward the conclusion, because I couldn't even begin to imagine what was going to connect these three disparate stories, and I was almost afraid that whatever Ryan had come up with wasn't going to be satisfying enough. I needn't have worried - the resolution is surprising but gratifying. There's also an undeniable thematic interconnectedness that I thought was handled wonderfully throughout the book. I thought Ryan's examination of the role of storytelling in the lives of these three men was a beautiful element, as well as the similar yet distinct meditations on loneliness and grief as each of these characters search for some kind of peace. 4.5, which I'm rounding down now for the weak middle section, but which I may round up later depending on how this book stays with me over time. I really loved this. I've been waiting for this novel for a while, and when it landed on my ereader I told myself I would go slow. I couldn't do it. The language sucked me in and I kept reading until I finished. It's a short novel but packed with beautiful imagery and interesting characters. The book is divided into four parts, with the first three introducing different narrators and settings and the fourth bring the three disparate stories together. The first, Farouk's story, is shattering. 4.5 stars, rounded down. The book is divided into four parts, with the first three introducing different narrators and settings and the fourth bring the three disparate stories together. The first, Farouk's story, is shattering. Farouk is a doctor in Syria and he and his family have paid a broker to get them out, via boat, to Europe and future safety. Farouk's wife is ready to take the risk and their daughter is cheerful and relatively unaware. When things go terribly wrong, Farouk can't cope with the reality. The second story is told from the perspective of Lampy, a young man who lives with his mother and grandfather in a village in Ireland, working for a care facility that cuts a lot of corners. Lampy is dissatisfied with his life but doesn't really know what to do to change it. He passed up an opportunity to emigrate to Canada, mostly because he knows how much he means to his family. But he's angry a lot and still depressed over the loss of the woman he considers his great love. We see him sparring with his grandfather, absent-mindedly carrying out his duties, and flashing back to good and bad episodes in his past. His absent father and illegitimate status have shaped his life, bringing another dimension of masculinity into the text. In a small village where you are your ancestors, Lampy is missing a major dimension. If Farouk is pushed out of his privileged context, Lampy is stuck in his disprivileged one. The final character to tell his story is John, an older man who is essentially confessing to all his sins, which are many and sometimes terrible, spun out over the course of a long and busy life. The death of his beloved brother and favorite son shapes parental and sibling relationships in terrible ways, but it wasn't clear to me that John wouldn't have been pretty awful even without that tragedy. Be that as it may, he finds contemporaneous excuses for many of his most brutal and horrific actions, but in retrospect he knows his behavior for what it was. The three stories are told in different registers, with different cadences and language. Ryan does a phenomenal job of making each character unique and individual, and the settings match the interpretations. Lampy's is the most concrete, with Farouk's and John's being more abstract. In the final section the connections between the stories are shown to devastating effect. Some of the connections were clearly foreshadowed in the earlier sections, so they weren't a surprise to me, but others were completely unexpected. There's a little bit of writerliness in the wrapping up, but for the most part it is masterfully done. This is an imaginative, unexpected, fascinating novel. I have previously read Ryan’s The Spinning Heart and The Thing About December and neither of them were, for me, anything to write home about. I can understand why many people have rated them highly, but whilst I didn’t hate either of them, I also didn’t feel any urge to read All We Shall Know. Originally, I was planning to leave this one until the Booker short list is announced and only read it if it made the cut. However, I quickly realised I was easily going to finish all the other 12 before t I have previously read Ryan’s The Spinning Heart and The Thing About December and neither of them were, for me, anything to write home about. I can understand why many people have rated them highly, but whilst I didn’t hate either of them, I also didn’t feel any urge to read All We Shall Know. Originally, I was planning to leave this one until the Booker short list is announced and only read it if it made the cut. However, I quickly realised I was easily going to finish all the other 12 before the short list (this is number 10 and the only delay will be waiting for Sally Rooney’s book to be published), and it seemed churlish to ignore just this one. I’m glad I read it. For my tastes, this is a far better book than the other two I have read. The novel begins with a passage about trees (reminiscent of Richard Powers’ The Overstory which is also on the long list). This seems to concentrate on the connectedness of trees, the way they communicate with one another and send assistance to one another in ways that we are only just starting to understand. This idea of hidden connections is a clue to the rest of the book which consists of four parts which tell us three apparently unconnected stories and then, in the final part, show the (surprising) links that tie them all together. I was tempted to wonder whether Ryan always planned the book this way or whether he had three short stories and realised he could connect them and make a novel. The first short story drops us right into a topic that is becoming a strong motif across the Man Booker long list: borders. Several books have looked in various ways at borders or boundaries (Everything Under, Warlight, Sabrina) and here we read about Farouk who sets off to escape his home country and head for Europe to make a new life. It is a story of border crossing. I think this is the story that gave me confidence this was going to be a better book than the others I have read by Ryan: I took quite a liking to Farouk even if the story he is part of is perhaps the least well-realised of the three. Then we read about Lampy. Ryan is back on home ground here, writing about unhappy Irish people in Ireland. It feels as you read like he is more comfortable doing this. Lampy’s story is one of loss: his father disappeared before he was born, his girlfriend has gone away to university and is losing interest in him. Lampy dreams of escaping to a new life (another border crossing!). The final story links the first three together in a way that you cannot guess from the earlier parts of the book. It harks back to the opening passage about the hidden connectedness of trees. A story of loss, of men who have been damaged by love and life.